You have possibly seen the #symbiangives campaign… so what have we really given to the community by going open source? 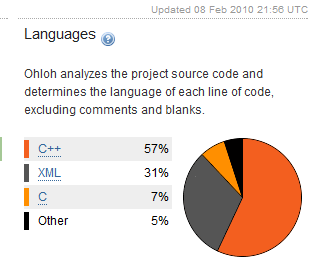 According to Ohloh, we are giving over 40 Million lines of code between the platform and the development environment! Some of you may find interesting that the platform includes 13M lines of XML and some ADA, Lisp and a bit of AWK, so there is something for everyone! Our Ohloh entry hasn’t been up for that long, but it would be great to get some more support – so if you are registered in Ohloh and use Symbian, why not join the project? Previous Post 8 minutes lesson on economics… westcoast style!